A large 245 m2, 4 bed room, 4 bathroom villa apartment in Elmar Montazah, Sharm el Sheikh. 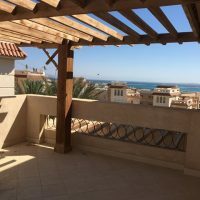 Modernly decorated and tastefully furnished with 4 balconies and a large roof terrace commanding some amazing views of the beautiful Sinai mountains and the crystal clear waters of the Red Sea. Fully air-conditioned and well maintained this property is ready to move in. Montazah is a village like setting set back from the main road running parallel to the airport. Known for its sandy beaches and world famous diving site Ras Nasrani, Montazah is quickly becoming the place to be seen. Parking available.